mit for text messages -- and when the time is up, the messages will self-destruct and be wiped from the original phone, the receiving phone, and the server. It's perfect for cheating spouses, shady politicians, sexting teens, and people who send a lot of stupid texts while drunk. The app itself is free to try (the first 100 messages in 15 days are free, and it's always free to read messages), and only $1.49 per 250 messages sent per month ($2.49 per month for unlimited messages) after that. Once you've downloaded it, you must sign up for an account and tether it to your phone (it sends a confirmation to your number), and then you can start sending self-destructing messages right away. 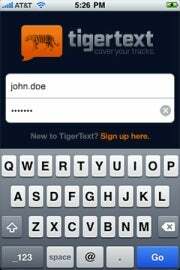 Message recipients must also download TigerText , and then they can read the message for free. You can set a time span for a text (for example, the text can be set to delete itself two hours after deliver, whether it has been read or not), and another choice is "delete on read," which causes the message to delete itself 60 seconds after the recipient has opened the text (how Mission Impossible!). The messages are never saved on your phone, the recipient's phone, or, worst of all, your carrier's database -- they are only saved on the TigerText server, which the vendor reports is purged every minute of the day. The messages cannot be forwarded or copied (though, of course, if someone is really trying to screw you over, they could always take a photo of the message). There's also a "delete history" option that deletes all evidence of any conversation from your own device upon exiting the application (although the application doesn't save the actual text messages anywhere, if "delete history" is not enabled it will keep a record of when, and to whom, you send texts, on your device). According to a Time report , the app was actually named before the Tiger Woods scandal, and is aimed at people who are simply concerned about privacy -- not necessarily people who have something to hide. TigerText founder Jeffrey Evans expects that lawyers and business execs are more likely to be interested in this type of privacy than drunk college students and sexting teens. TigerText is currently available for the iPhone and iPod Touch, and is coming soon to Blackberry and Android platforms.